We enjoy teaching the 8 Wastes of Lean Thinking to our clients and the participants in our training workshops. As instructors, we share examples of ‘Wastes’ from our professional experience in both manufacturing and service-related organizations. Together, we brainstorm ways in which the wastes reveal themselves in our attendees’ organizations. 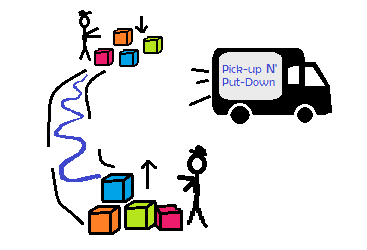 One question that gives us pause in every Introduction to Lean Thinking workshop is the request to explain the nuance of two ‘movement’ wastes – motion and transportation. The motion waste focuses on the movement of people or equipment that is unnecessary. It is any movement beyond the minimum required for completing the process step. The motion waste is typically found within a workspace or process step rather than between steps. Walking to a community printer or searching for information or a tool are both wastes of motion. Ergonomic issues – reaching, stacking, repositioning, and clicking – are also common. Wasted motions can be large or small. Large motion waste is often identified as walking or traveling between work areas or to a centralized storage room. Several clients have noted that they like needing to move from their desk and stretch occasionally. We like stretching too, but it is still wasteful if your process requires wasted movement to complete the work. It is better to remove the waste, finish your work more efficiently, and have 15 minutes available for a short walk outside on a sunny day. Small motion wastes may seem insignificant at first, but they really add up. For example, using an automatic screwdriver to eliminate twisting motion when tightening a screw may save just a few seconds per turn in a workstation, but many hours of time over the course of a week, month, and year. Implementing good “5S” visual workplace practices will generally eliminate many of your small motion wastes. Searching for a file leads to unnecessary movement and the waste of 'Motion'. The transportation waste is not about the person or equipment creating the value, it is rather about the movement of the product, information, or customer itself when this movement does not create value. Transportation occurs between process steps and workstations rather than within them. Transportation, like motion, is a highly visible type of waste. The transportation waste in manufacturing can be easy to observe and identify. It may be pallets of product moved with a forklift, or trucks carrying product between worksites. Returning unsold product from retailers back to the warehouse is waste. Conveyors are often installed in factories that automate the waste. Don’t be fooled; it is still waste. Unnecessary transportation often occurs because of poor facility layout and poor logistics. Lean East works with many service organizations (healthcare, government, construction trades, etc.) where large quantities of product are not moved around in a warehouse. For these clients the transportation waste is not immediately intuitive or tangible to identify. But once understood, these kinds of wastes begin to be revealed. In healthcare, patients often directly experience the waste of transportation as they are moved from waiting room to waiting room, with zero value delivered. Don't Pick it up & Put it down! Identify and remove 'Transportation' wastes in your processes. Even consulting professionals can find new ways to find and remove waste! I recently eliminated several wastes from one of my financial processes by downloading my financial institution’s app that allows me to use my mobile phone to photograph the check front and back from the comfort of my office. This simple depositing feature is saving our team the time needed to drive to the bank (transporting checks), filling out deposit slips, and waiting in line. Wasted movement – Motion and Transportation – occurs when people and equipment, products and information, moves around without creating value. Ultimately, giving a name to the kind of waste you have identified is not the objective. The Objective, and the effort that will improve your work processes for your employees and clients, is to identify what efforts add value and remove the waste, whichever kind of waste it is.